Randall Kallinen is an attorney specializing in civil rights cases. His law office is in a warehouse-like space on Broadway, spitting distance from the ship channel. 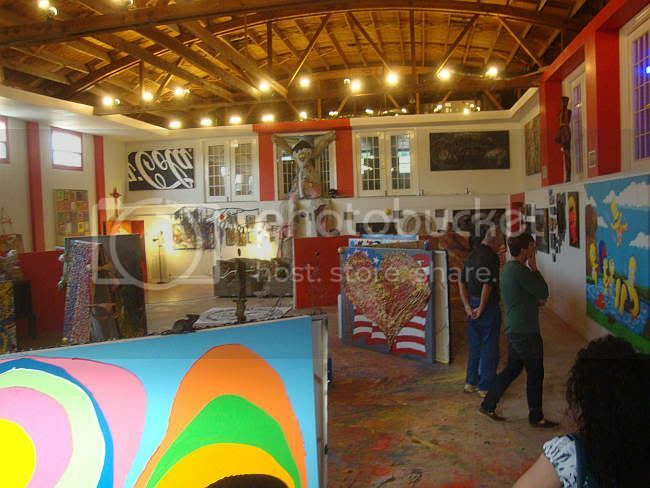 He has turned that space into an art gallery, and for its inaugural exhibit, the space has been crammed full of art, including a lot of his own work. 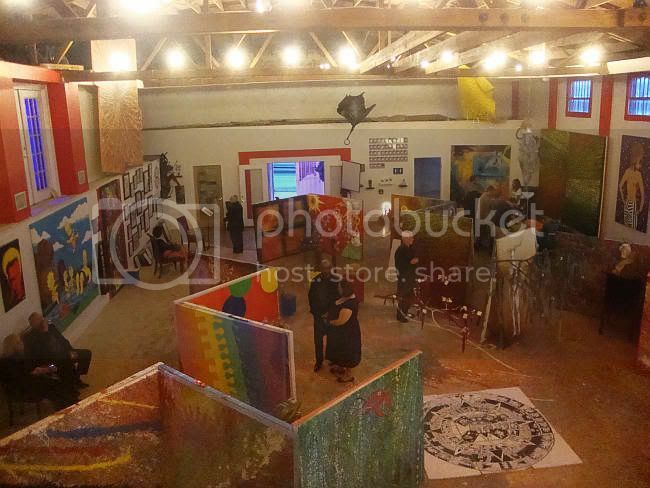 His large, paint-spattered canvases are actually used as temporary wall-space in the big floor of the warehouse. 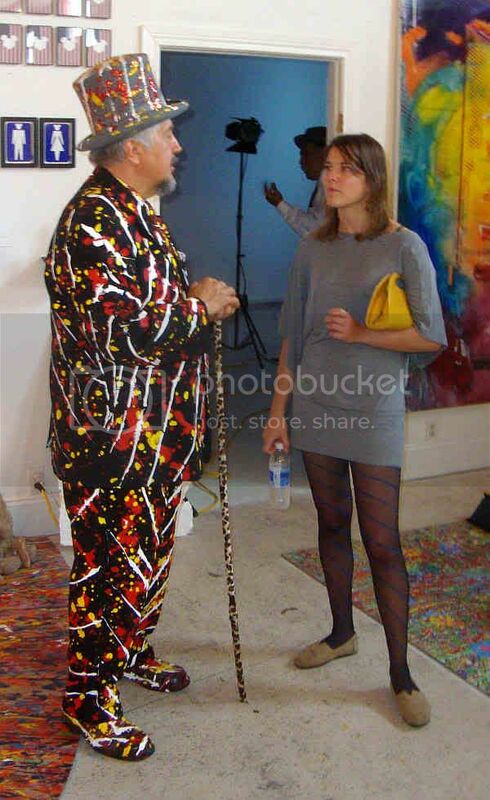 Kallinen himself hosted his opening in an outfit that was half flâneur and half Jackson Pollack. Describing this show is a bit fruitless. Fortunately, I took a lot of photos and a few of them were more-or-less in focus. 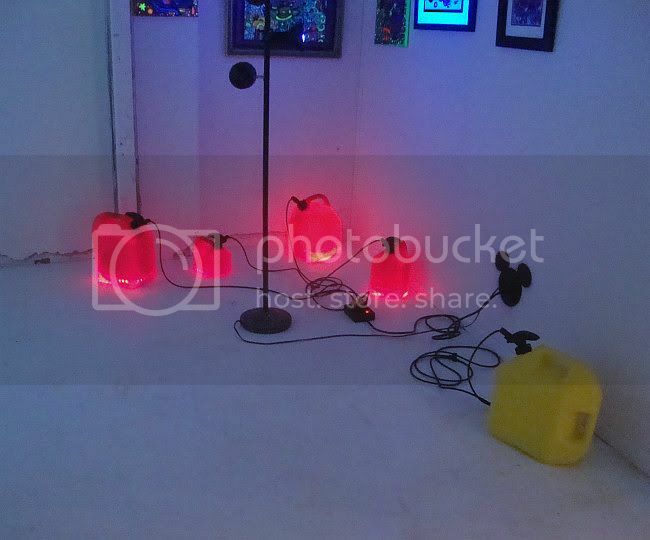 So presented here are a bunch of photos, some annotated, of one of the weirdest art shows I've seen in a while. Yamin Cespedes' 8th Passenger is kind of the ultimate hunting trophy. Keep your Ibexes and Siberian Tigers--I bagged an Alien! Amerimou$ had some of the most interesting art in the show. 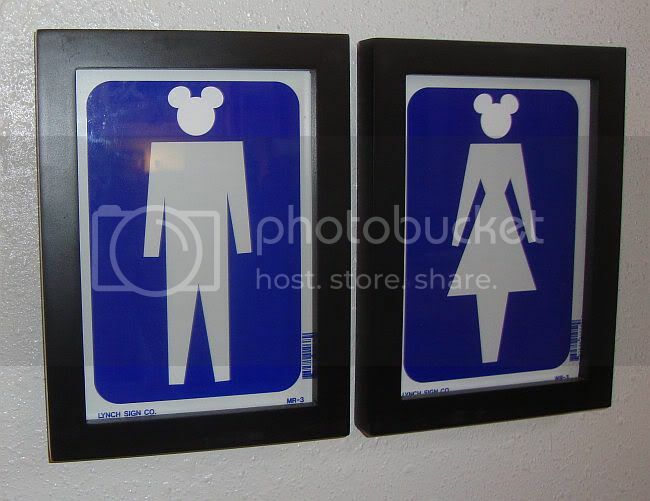 In addition to pieces like these two bathroom signs (where he takes the simplified Mickey Mouse logo and combines it with generic "ped" figures), he also has some intriguing sculptural work. To me, this is a better piece than the "Mickey Mouse" ear pieces. Attacking Disney as a generic representation of fake plastic America, a sterilized fascist simulacrum--well, it's been done. Done over and over since the 60s. But this sculpture, while its political meaning is obvious, also has a beautiful, slightly mysterious presence. This is what makes it a stronger work. I mistook this piece by John Paul Hartman for a bronze sculpture at first, but it's mostly plexiglass painted to look bronze. The bronze gives it the look of municipal sculptures--founders of universities (like the statue of William Rice in the quad at Rice University) or famous war leaders (like the Sam Houston statue in Hermann Park). What I think about when I see bronze are war memorials. I lived in rural New England, and small towns there almost always had memorials for the war dead from the Revolutionary War, the Civil War, World War I, etc. 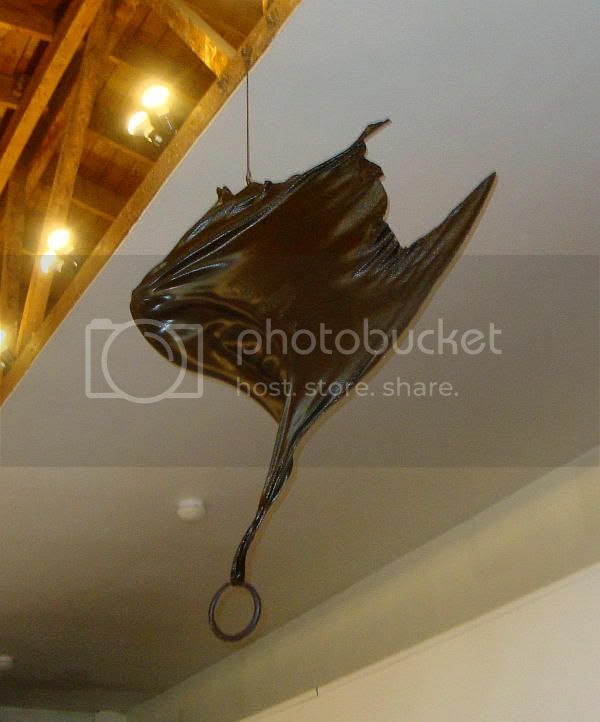 But this sculpture, a flapping wing diving down toward the viewer, is a monument to fear. We lived in fear from the skies after 9-11, and now our enemies (and many, many innocent bystanders) look fearfully to the skies for our own screaming Predators their Hellfire missiles. 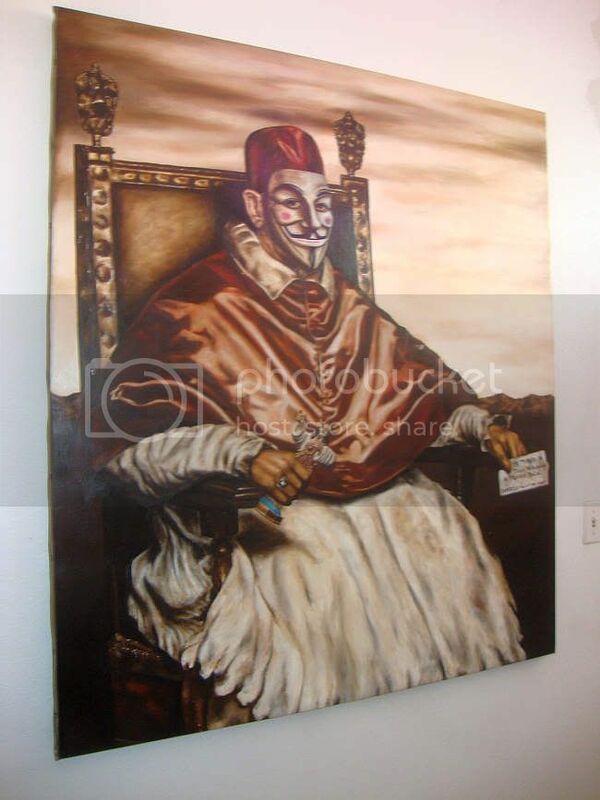 Pope not so Innocent by Camago Valentino (who apparently studied with Odd Nerdrum!) is a tribute to Velazquez and I guess Francis Bacon, it seems to have been painted too early to be a tribute to Occupy Wall Street--but it's hard not to read it that way now. There were several glowing sculptures, including Turn on Your Love Light by Alicia Duplan, which I thought were excellent. They had to be displayed in a darkened room. The dark in this case becomes a part of the work. 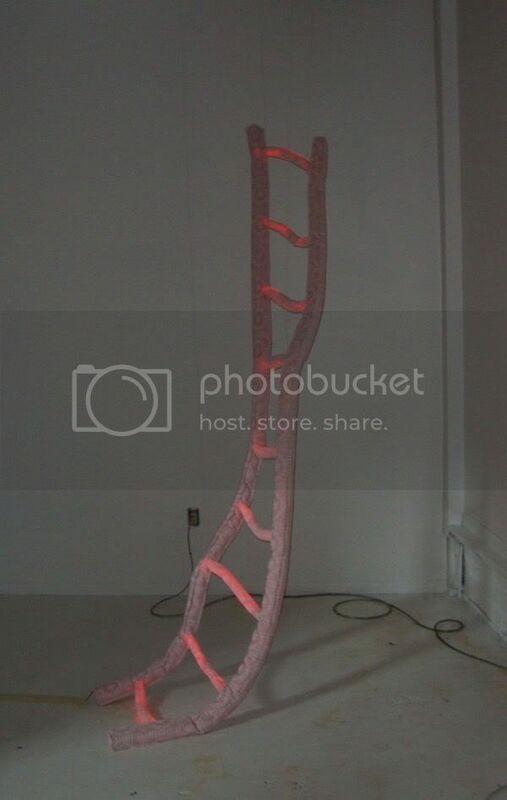 Here is another self-illuminated work, this time by Ariane Roesch. 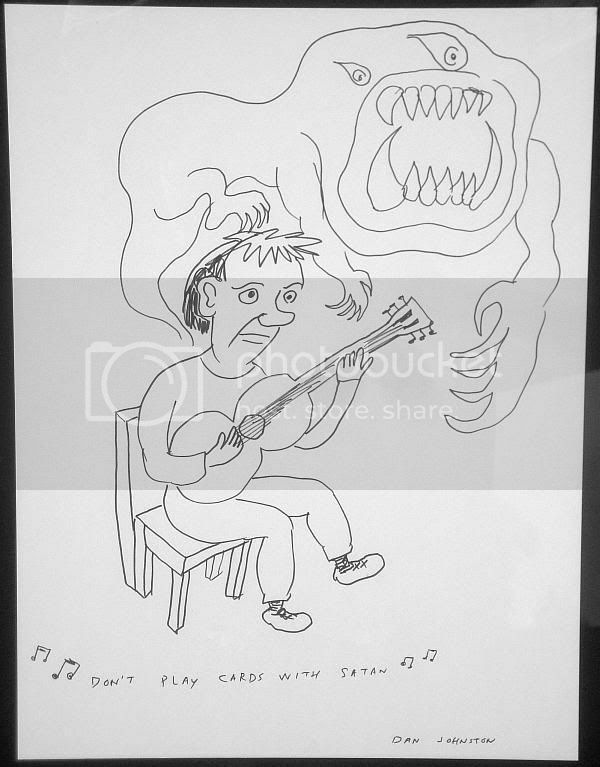 Daniel Johnston, Don't Play Cards With Satan, marker on paper, 20" x 15"
William Reid is Daniel Johnston's nephew. 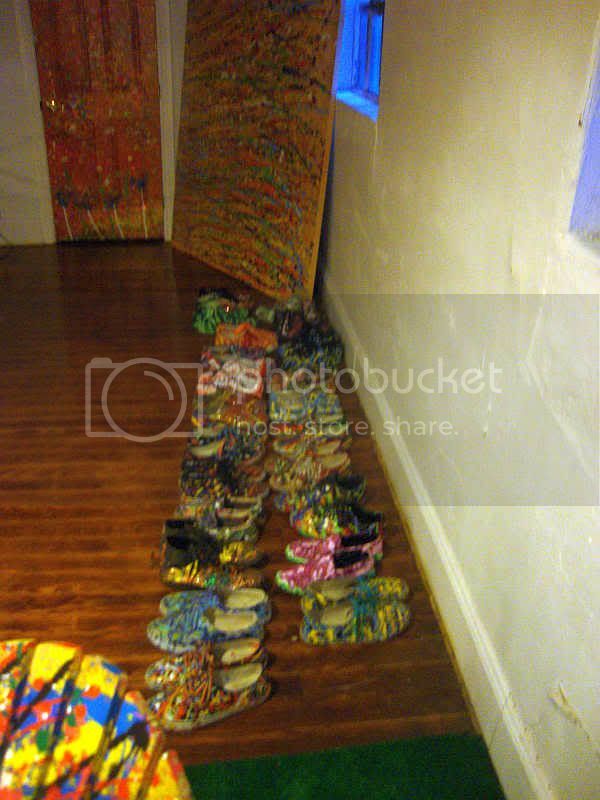 He's a presence in Houston at various art openings, but I really knew nothing about his art until I saw his pieces here. The paintings he showed had a painted element and an element that was created with sparklers burning the surface. Naturally this makes one think of Cai Guo-Qiang, but the work actually resembles in some ways the art of Bill FitzGibbons, who uses a blow-torch (I believe) on his otherwise white canvases. I guess I'm saying that burning an image onto a canvas is not the most original idea in the world (let's not forget Yves Klien's fire paintings from 1961! ), but Reid does a good job of making an arresting image out of paint and burnt gesso. 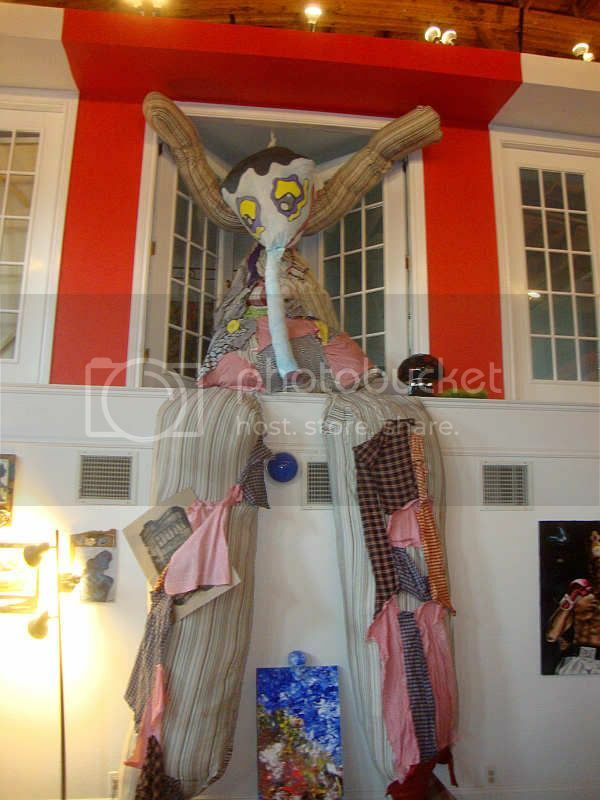 I remember seeing Edu Portillo's, Gonzo the Clown hanging out around the U.H. art department. 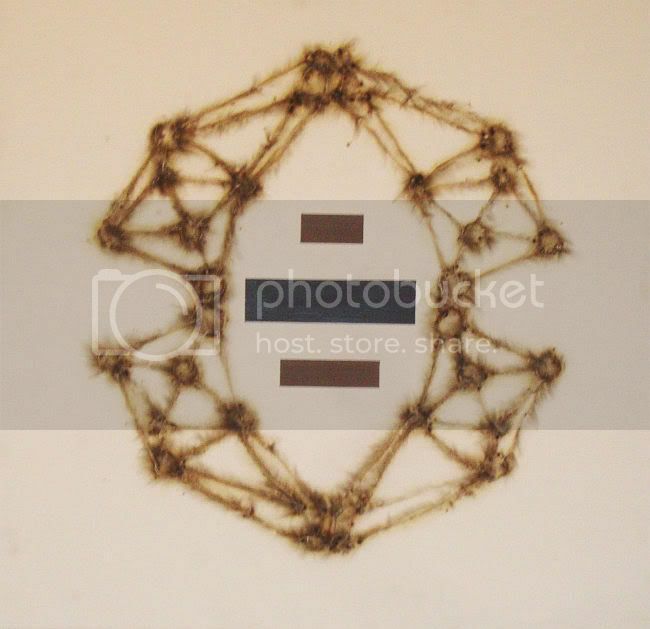 Nice to see it displayed in a venue that can accommodate its immensity. 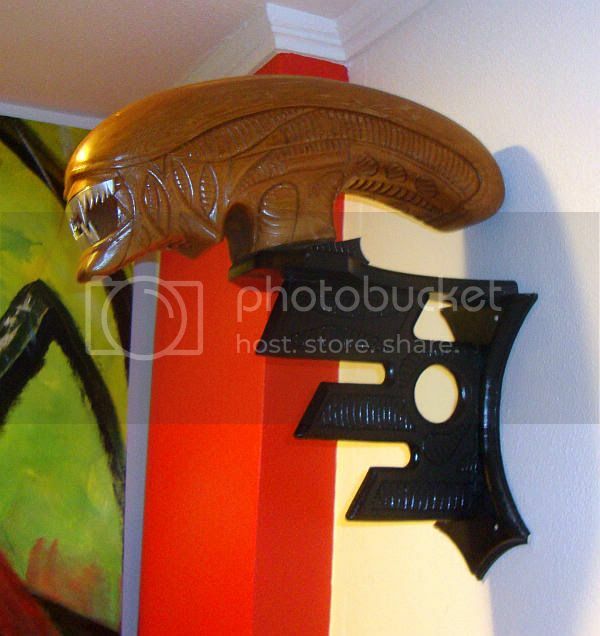 This piece would scare me if I was a child, I think! My previous contact with Kelley Devine had been with her paintings of super-thin model-like women, which I didn't care for. She has a sculptural installation in the show, but what caught my eye was this image on her t-shirt, where a woman (typical of the women she paints) with antlers. The antlers are textured with typography that looks like it comes from a newspaper. This shirt is related to a series of paintings she has done collectively called "Dangerous Games." But I like the graphic quality of the shirt better than the paintings. Some of her drawings on printed pages have this quality, as do some of her prints. But this shirt suggests that maybe she should consider working in silkscreen, combining her drawing and printed matter in one graphically bold combination.